The present article aims at proving that the Cameroonian Diaspora, otherwise referred to as ‘bushfallers’ or ‘bushfalling’, is an indispensable tool for local development. Through its contributions to local development in the country of origin, it has asserted itself as an important source of financing development projects back home in Cameroon. However, the projects financed by the Cameroonian Diaspora lack coordination simply because the Cameroonians living abroad have not constituted an organization that consolidates the entire Cameroonian Diaspora. Instead, the Cameroonian Diaspora groupings are formed through ethnic or community linings. Against this background, this article has specified and discussed some challenges faced by the Cameroonian Diaspora as far as local development projects in Cameroon are concerned. It proposes recommendations that will make the involvement of the Cameroonian Diaspora in local development projects perceived more at national level and not just at ethnic levels. Keywords: Diaspora, bushfallers, remittances, local development. The Diaspora and homeland development discussions have been recently in the spotlight of many scholars and development practitioners due to the potentials evident in their capacity and ability to develop their homeland. However, as Dembele Moussa says, ‘Diaspora should not be considered as instruments but rather should be understood as partners in development’ (Dembele Moussa 1999: 39). The formation of the African Diaspora started long before the transnational globalized world originated. It goes back to the period of slavery in the times of colonization, when slaves were taken to other countries to work in mines, plantations and so forth. In other words, the African Diaspora appeared as a result of the Trans-Saharan, Trans-Atlantic and Indian Ocean slave trade. In the later period, the Diaspora formation grew due to global political and economic dominance which forced people to migrate to economically wealthy countries in search for opportunities, better education and better life. Besides, it is also noted that, other Africans left their countries of origin to settle abroad due to reasons such as poverty, natural disasters, civil wars and political instability, family reunification and employment transfer. Different from the pre-19th and 19th century immigrants, the 20th and 21st centuries immigrants are more exposed to rapid communication growth and transportation networks that have made their communication with their relatives in Cameroon easy and accessible. This came as the result of evolution of globalization and its advantages (Butler 2001). A common feature of globalization in recent times has been the increasing movement of people around the world. Discoveries in communication technologies and great improvement in transport facilities, have transformed the world into a global village. People can travel easily around the world within the shortest possible time to and from different countries and regions, motivated by diverse factors ranging from the search for better living conditions and for security to taking advantage of economic opportunities. It remains an undeniable fact, as Mahroum asserts that ‘people are more transnational today than at any other time in history, and successful economic development […] depends on human capital crossing borders’ (Mahroum et al. 2006). One of the consequences has been the Africans' mass migration to the rich countries in the Northern hemisphere, especially to Europe and North America and over a long period of time, this has been contributing to the emergence of a rather large African Diaspora in this parts of the world. Due to the potential role in development of the countries of origin, the ‘contemporary Diaspora’ has gained a lot of attention among scholars, development practitioners, analysts as well as policy makers. For instance, according to Newland, The Global Development Finance Annual Report in the year 2003, showed that around US$ 100 billion was registered as a flow of remittances to developing countries in 2003 (Newland 2004: 67). In such a context, when the contributions are real but unequally distributed along the national territory and are also quite limited, this study aims at proposing the incentive measures for the case of Cameroon that will render the contribution of the Cameroonian Diaspora more efficient. In this perspective, the elaboration of a status becomes indispensable if we really want the Cameroonian Diaspora to serve as a veritable partner for local development. The analyses of the Cameroonian Diaspora activities allow us to present the role of the Diaspora in local development. This paper is structured as follows: the first section is devoted to various dimensions of the Cameroonian Diaspora. Section two examines the contribution of the Diaspora to local development. Section three discusses the limits of the Diaspora contribution to local development and the last section will propose measures that will make the Cameroonian Diaspora more engaged in local development. The contemporary Cameroonian Diaspora movement which is the focus of this paper started in the 1960s. The living conditions, collective ambitions, the story of a peculiar lifestyle and individual adventures are some of the reasons that pushed the Cameroonians to leave for countries with better living conditions. These factors led to the situation when at the advent of independence in 1960, Cameroon initiated development programs aimed at facilitating the emigration of its citizens to countries like West Germany, the United States of America, Canada, the United Kingdom and France. The unique objective of these programs was to prepare the Cameroonians who will come back and put the acquired skills at the service of the State. On the other hand, due to its animated history (that was characterized by a political upheaval following the independence of the nation that according to some political architects was granted and managed by those Cameroonians who fought less for it) made Cameroon witness an important migration wave facilitated concomitantly by the restriction of certain liberties and by calls from political asylums living in Europe with the desire of recruiting susceptible Cameroonians for an elaborate political rivalry. The number of the Cameroonians who migrated during that period was insignificant and those who travelled out had the urge to come back, because they believed they had a contribution to make as far as local development was concerned. The migratory phenomenon gained grounds in the 1970s with what was commonly referred to as the ‘brain drain syndrome’. The Cameroonians of diverse skills left the country for Europe and North America in search for competitive wages and talent recognition (Corm 1993). During the early 1980s, many Cameroonians decided to leave the country due to a drastic drop in the prices of agricultural commodities (which were the mainstay of the Cameroon economy) and the economic crisis that followed. Submitted to the structural adjustment programs designed by the World Bank (WB) and the International Monetary Fund (IMF), in addition to economic downturn, Cameroon equally witnessed an acute social crisis. These constrained businessmen, civil servants entrepreneurs and university graduates to leave the country for Europe and North America in search for new pastures or better living conditions that could only be found in either Europe or America (Ibid. : 70). Following the devaluation of the franc CFA in January 1994, and the 70 per cent slash of salaries, many civil servants, who were also heads of families, resigned from the public service, abandoned their jobs in Cameroon and left for Europe or America, where they believed they could make ends meet. In addition to the above mentioned factors, we may also say that the liberalization of the economy that proceeded together with the emergence of the informal sector favoured the migration of some Cameroonians to the western hemisphere. From such adventures, there developed a phenomenon known as the ‘bushfalling’ or ‘bushfaller phenomenon’ (Alpes 2011). The issue of external migration is common in Cameroon and referred to by the term ‘bushfalling’. ‘Bushfalling’ is the act of going out to the ‘wilderness’ (bush) to hunt down meat (money) and bring back home the trophies. ‘To fall bush’ implies trying against all odds to leave the country, (i.e. fall) and earn money that is sent back to the family in Cameroon. ‘Bush’ is the term used to describe ‘white man country’ – largely understood as the ‘West’. A person who has successfully traveled or migrated is called a ‘bushfaller’ (Nyamnjoh and Page 2002). In the beginning of the 21st century, Cameroon has witnessed a new category of migrants, notably those who left for fear of desertification, drought, famine and their consequences. The migrants of this kind were referred to as ‘ecological migrants’. This group has also incorporated the economic migrants who were victims of endemic unemployment and poverty. Considering the fact that migration changes depending on periods and circumstances, it should be noted that in addition to the initial reasons, there are other supplementary motivations. First, the migratory networks encourage the anxiety or eagerness as they become more and more sophisticated in the matter of escaping reinforced control at the terrestrial, maritime and aerial borders (Ibid. : 32). Those who choose this path should have enough financial backing and welcoming networks in the countries where they desire to settle. The category of people who have chosen this path is mainly youths and educated males. Then, there is the factor of what is known as imaginaire migratoire which is propagated by media and information and communication technologies. The advent of television in Cameroon after 1985 allowed the Cameroonians through television serials and documentaries to have a virtual access to western societies and their economic and social well-being which is far off from their daily realities (Assogba 2002). Access to the Internet and cable television has come to revive this urge of ‘bushfalling’ in many young Cameroonians who are ready to risk their lives for a purported better tomorrow. New factors at the origin of the Cameroonians' migration to Europe, America and Asia include family regroupings on a kin basis. In this case a family member leaves Cameroon legally or illegally to settle abroad. Later on, when he is economically viable, other members of the family join him. In addition, there is the procurement of the American Green Card which gives right to the Cameroonians to live and work in the USA and eventually become American citizens. This administrative status offers new possibilities for the Cameroonians to live and work in the USA which leads to a new phase of family regrouping to the advantage of parents, brothers, sisters, husbands and wives. This new sequential migratory model favored the departure of many Cameroonians to travel abroad. Following the 2005 estimations by the United Nations (Condamines 1993), the number of the Cameroonians legally living abroad was recorded as 136,909 people. However, the 2010 population or demographic census in Cameroon acknowledges that 2.2 per cent of the total population, approximately 200,000 Cameroonians live and work abroad. The distribution according to host country indicated that France had the lion share with 36,000 legal migrants from Cameroon of a total of 57,060 Cameroonians legally living in Europe. There are 2,070 Cameroonians legally living in Canada, 506 in Luxemburg, 3,040 in Belgium, 1,827 in the Netherlands, 14,414 in Germany, 3,012 in the United Kingdom and about 20,000 in the United States of America (Ibid.). The distribution of the Cameroonian Diaspora is better presented in Table 1 below. Among these numbers many have solicited and obtained the nationality of their host countries. Thus, from 1985 to 2005, 1,660 Cameroonians obtained German citizenship among them, 1,012 males and 648 females (Dewitte 1995). In 1994, 675 Cameroonians received French resident permits. In 2002, the number rose to 3,190. It should be noted that the Cameroonian Diaspora is distinguished by a strong student proportion. 4,245 students were registered in German universities between 2000 and 2005. In 2006, there were 203 Cameroonians studying in Luxemburg, 590 in Canada and about 9,000 in France (Ibid. : 86). Among the Cameroonians living abroad, 42.3 per cent are highly educated. Among them, we can find scientists, engineers, researchers, teachers, medical practitioners, writers, lawyers, artists, etc. Notwithstanding the great number of the Cameroonian Diaspora, it is worth noting that there is no structure to bring it together. Most often, the Cameroonian Diaspora is organized on the basis of host country and ethnic lines (Assogba 2002: 106). In relation to the host country, there are generally multiple relations depending on the adaptation capacity, the degree of professional and social insertion. These relations can move from partial or complete professional and social insertion to precarious situations such as joblessness, social exclusion and poverty. In any case, the Diaspora can be considered as an extension of the national civil society and represents a potential economic force of Cameroon that should not be neglected. The research how diasporas contribute to the development of home land has demonstrated that even though these people live far away from home, they are just as interested in the development of their home land as home based residents. But one may ask: why are they interested in homeland development? The Diasporas are interested in homeland development not just because of the belief that it is either theirs or their ancestors' original homeland, but because they also regard it as the place they or their descendants will eventually return one day when things get better. They believe that they ought to contribute either individually or collectively to the development, security and prosperity of their homeland. So, how do they contribute to development of their countries of origin? The Cameroonian Diaspora contributes to the development of their homelands through different ways such as remittances, technology transfer, social projects and political involvement. Remittances are an important component of the Diaspora's contribution to development as it is through remittances that most of other development activities become possible. The practice of sending remittances to family and friends is not new to the African Diasporas in general and to the Cameroonian Diaspora in particular, but it is in recent years that academia and political authorities have begun to pay greater attention to this sphere. Many developing countries have realized the important role played by the Diaspora remittances in the socio-economic well-being of their people and country. As a result of globalization, remitting from one part of the world to another is no longer a problem as money can be sent electronically within a few minutes. Remittances from the Diaspora play a very important role in many developing countries especially in poor countries of Sub-Saharan Africa including Cameroon. Many of these poor countries have become suppliers of labor (source countries) to developed countries and rely to a certain extent on the resulting remittances to ensure a better domestic welfare (Dumont and Lemaître 2005). For instance, according to statistics from OECD and the World Bank, the financial remittances from the Cameroonians living abroad stood at 11.0 million US dollars (about 6.600 million francs CFA) and 60.6 million US dollars (about 36.360 million CFA francs) in 1980 and 1990 respectively (Ibid.). The remittances declined to 40.0 million US dollars (about 24 million CFA francs) in 2000. Later, in 2004, the remittances rose to 103 million US dollars (about 61.800 million CFA francs). In 2006, the remittances from the Diaspora amounted 267 million US dollars (about 160.200 billion CFA francs). Being a poor country, remittances are very important for Cameroon's economy. In 2006, remittances to Cameroon from its Diaspora constituted 1.5 per cent of the country's GDP (OCDE 2005). Fig. 1 illustrates the official flow of remittances as a percentage of GDP from 2000 to 2006 (left diagram) and the amount of remittances received in millions of USD in 2000–2006 (right diagram). The amount of remittances in USD has more than tripled from 2000 (US$53 million) to 2006 (US$172 million) (Ibid.). In many families and localities in Cameroon, these remittances constitute the principal source of revenue. The funds are remitted in varied forms. Among them, we have cash wiring through Western Union, MoneyGram, bank transfers and also some other illegal means. Apart from sending money home, the Cameroonian Diaspora has equally undertaken different kinds of activities back at home. These activities range from small and medium scale businesses to large scale ventures, education and training, house-building, support for fundraising, charitable donations, paying taxes at home and transferring technology and knowledge (Lado 2005). The Diaspora associations have been involved in significant projects such as the construction of schools and community halls. As far as the Cameroonian Diaspora involvement in development is concerned, the latter also uses the medium of ethnic associations to serve homeland development. The most popular of the Cameroonian ethnic associations are the Bakossi Cultural and Development Association (BACDA) which encompasses all Bakossi sons and daughters living abroad and the Bali Cultural and Development Association (BCDA) Associations groups all the Bali Diasporas. Through these associations the Cameroonian Diaspora raises funds for different development projects in their homeland such as building schools, hospitals, sponsoring of agricultural projects etc. In the USA, the Bali Cultural Association usually sustains the traditional Bali Nyonga palace by providing accessories for the Fon and his traditional council. According to a group discussion held with notables of the Bali traditional Council, the Bali sons and daughters living abroad have sponsored many projects in their homeland. 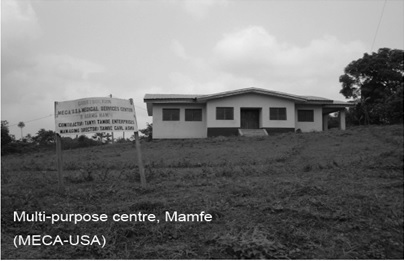 For example, they participated in the construction of a mortuary, building of a water catchment, paying salaries of part time teacher in the primary and secondary schools in the locality and building a community library to foster the literacy rate of the community.1 In Manyu Division of the South West Region, the Mamfe Elements Cultural Association (MECA-USA) has also been very active in initiating and executing some developmental projects in the Mamfe community. This association has constructed a multipurpose centre in Mamfe that has facilitated access to the new information communication technologies. In addition, this centre serves as a recreational spot. Below we present an illustration of the multipurpose centre. In addition to these developmental projects, we can give the following examples: the Cameroonian Diaspora has equipped the cybercafés (the case of Mamfe), equipped and restored the Fon's Palace (the case of Bali), equipped and restored government offices (the case of Bali), constructed the church buildings (the case of Mamfe in the South West Region and Ngie in the North West Region), constructed classrooms (the case of Baujo Ntai in Manyu), constructed water points (case of Bali), carrying out road maintenance (the case of BACDA-USA in the Bakossiland), providing shelter and education to the needy (the case of Shaping Destiny Orphanage in Batibo) and sponsored cultural events (the case of the Lela festival in Bali). Source: MECA-USA Photo Album 2009. Cameroon, through associations of emigrants whether from the same locality or not, have raised funds which were used to develop certain regions. This was done through the construction of schools and hospitals, rural electrification, support and/or assistance in case of natural disasters, etc. Most often they initiate the contacts between service delivery structures localized at home and organizations or associations of their host country. It is in this perspective that the French association Biology Sans Frontières (BSF), which is an association of development aid to long-term medical biology, visited Cameroon in 2006. This visit was negotiated by an association known as Biagne. After this visit, Baigne provided the Mbouo Evangelical Health Centre with medical equipment (Pelican 2010). In the same vein, it is worth noting the efforts by SAWA women in the Diaspora who in 2007 donated medical equipment to the District Hospital of Deido. The most important contribution of the Diaspora remittances for the implementation of development projects is concentrated in their villages or communities of origin. Thus, the Association of Bahams constructed two classrooms for Lycee du Baham in 2007, a secondary school in their locality. These classrooms have solved the perennial problem of overstaffing in classrooms characteristic for many public schools in Cameroon (see Endnote 1). There has been an upsurge in discussions about the ability of the Cameroonian Diaspora to transform their communities and country. This is based on the assumption that the Cameroonian Diaspora possesses enormous capacities and opportunities; and if to use this resource properly, it can contribute to the development of Cameroon. Nobody will deny that the Cameroonian Diaspora possesses capacities and opportunities to serve the development of Cameroon especially given the present number of its Diaspora that stands at about a million, as well as the amounts of remittances sent home annually. Regarding the scale, there are roughly 20,000 citizens of the Cameroonian descent in the USA, with a collective purchasing power of $ 10 billion per year (Samba and Le Masson 2005: 15). In the European Union (EU) alone, figures show that there are 57,000 Cameroonians living within European Union. As far as remittances are concerned, the World Bank reported in 2006 that Cameroon alone received about $203 million. This amount includes only official transfers which are increasingly registered. Meanwhile, a substantial portion of remittances are informally transferred and are not taken into account (Ibid. : 23). The fact is that, on paper the figures are amazing but in reality most of the Cameroonian Diaspora members are still unable to transform their homeland in a way that it would be commensurate with the amount of remittances and their capacity and abilities. The ability of the Cameroonian Diaspora to contribute to the development of their country lacks publicity. It is in a bid to account for the paradox between what is remitted and what can be shown for it, and this section attempts to explain the challenges and obstacles that limit the ability of the Cameroonian Diasporas to effectively serve as agents of development to their country. All these positive activities clearly confirm that the Cameroonian Diaspora is actively participating in the development of Cameroon. They have become an indispensable human agency that channel wealth, information, innovative ideas, intellectual capacities and skills and creative business practices from the West to Cameroon. More importantly, the Cameroonian Diaspora as well as any other African one benefits the global transnational networks to which it is linked in many ways. They benefit by gaining a strategic position which enables them to build up social, economic and political bridges that link to both worlds with valuable advantages. Unfortunately and despite all the above noted advantages, the Cameroonian Diaspora still operates on the margins of the host societies because of the weak social, economic and political position in which they find themselves in their new homelands. Furthermore, in the donor world both governmental and non-governmental mainstream agencies, the invaluable efforts of the Cameroonian Diaspora in particular and the African Diaspora on the whole do not count when it comes to development policy and practice regarding Cameroon and Africa. Similarly, their views and intellectual input to development strategies are neither sought nor appreciated. Further, the organizations established by the Cameroonian Diaspora suffer from severe capacity constraints. First, they lack the opportunity to make their activities more visible to the wider public. Second, their social organization is weak and remains informal. Third, the Cameroonian Diaspora organizations lack the channels to gain access to useful information and networks. Fourth, compared with other migrant organizations, the Cameroonian associations are linked marginally with the mainstream development agencies. These constraints, consequently, need to be discarded in order to more efficiently employ the potentials of the Cameroonian Diaspora organizations. Fortunately, there is now a new climate of change that recognizes worldwide the potential and valuable social capital of the Cameroonian Diaspora. The mainstream development organizations begin to adopt a new approach towards the African Diaspora organizations which are set up to help to promote development in Africa. There is currently a bunch of opportunity for the African Diaspora organizations and the mainstream development agencies to join forces in partnership for the development in Africa. Although there are numerous advantages to be gained by joining forces, it is not yet clear how this new partnership can be given a concrete shape since it is still embryonic. A further study is needed that will identify the most appropriate ways and strategies through which this new partnership can be given a concrete form and which will elaborate the most appropriate policy designs and practical actions to achieve this. Similarly, the history of Africa has been a factor limiting the extent to which the African Diasporas can help to develop their countries of origin. Furthermore, the ‘dark history’ of slavery and colonization has left an indelible mark on all people of the African descent and especially black Africans. In Europe and North America, the African Diasporas have to deal not only with racial discrimination, but also with other stereotypes erroneously associated with the black race. This paper outlines four issues that broadly highlight some points and strategic actors and organizations at which concrete activities and actions can be initiated. Our preliminary findings also identify the areas in which further research and policy intervention is necessary. – The stakeholders in Cameroon's development should recognize the impact of remittances transferred by the Cameroonian Diaspora on pro-poor finance, poverty alleviation and emergency aid in Cameroon. The remittances are fast, they directly reach the poor, and, therefore, are an effective means of relief and rehabilitation, and provide benefits to many people at the bottom of society. The mainstream development sector could start experimenting with channeling a part of their emergency aid through the Diaspora channels. – The stakeholders in Cameroon's development should recognize the potential impact of the Cameroon Diaspora remittances on economic development, savings mobilization and productive investments in Cameroon. Cameroon could benefit greatly from remittances if such resources were channeled through an appropriate infrastructure generating savings and investments. This recommendation calls upon the Cameroonian Diaspora and other parties to initiate the establishment of a Diaspora Bank (or Fund) in their host countries to pool Diaspora remittances, to help set up similar Diaspora Banks (or Funds) in Cameroon, and thus, to create a banking network that generates savings for investment in Cameroon. – The Cameroon government should provide a structure for investment (especially in rural areas) of remittances. Cameroon lacks a rural banking system. The post office network could be used as a feasible structure for establishing rural branches of the Diaspora Bank (or Fund). The Cameroonian Diaspora is linked to vast transnational networks at different levels. The Diaspora benefits from numerous possibilities offered by global networks. Although the linkage may be low-level, the advantages of transnational networks will allow the Cameroonian Diaspora to gain a strategic position which enables them to build up social, economic and political bridges with valuable benefits. It also makes them an indispensable human agency for channeling wealth, information, innovative ideas, intellectual capacities and skills and creative business practices from the West and Asia to Cameroon. However, despite all the valuable benefits they dispense, the Cameroonian Diaspora in the Europe and North America still operate at the margins of the society because of their weak social, economic and political position. Added to these disadvantages is the fact that most of the Cameroonian Diaspora associations suffer from severe capacity constraints. – To enhance the publicity profile and influence of the Cameroonian Diaspora requires a greater synergy between Cameroonian Diaspora associations through information sharing and joint activities, for example, the organization of public relations exercises. – The links should be strengthened between the Cameroonian Diaspora across the globe in order to pool viable financial and intellectual resources. – The Cameroonian Diaspora organizations in Europe, North America, Latin America and Asia should establish close working relations with the Cameroonian institutions and programs, such as academic institutions, local development agencies and civil society networks. – The short or long term remigration of the Diaspora Cameroonians as an important means to inject skills and experience into Cameroon. The remigration will also provide a way out of unemployment for many skilled Cameroonians living in the Diaspora. – The capacity of the Cameroonian Diaspora organizations should be enhanced through learning and training courses. – One should promote a climate that fosters dialogue, celebrates success, builds confidence and gives rise to driving forces. – One should facilitate the promotion of small-scale business in Cameroon through the Diaspora as small informal businesses have now become the essential means of survival for a large part of the Cameroonian society. – One should recognize that the Cameroonian Diaspora remitted finance is the only inflow of capital that sustains small-scale enterprises in some areas in Cameroon. – One should appreciate the potential role that the Cameroonian Diaspora plays in promoting the Cameroonian exports overseas since many small and medium enterprises in Cameroon cannot afford to travel abroad in order to promote their products, find distributors and establish contacts with export marketing partners. – It should be recognized that the Cameroonian Diaspora remitted finance is not all used for consumption but also to support the creation of schools, health centres and community projects at village and district levels. – It should be appreciated that these small-scale community-oriented projects contribute considerably to the alleviation of poverty among individuals and other institutions through job creation and the provision of basic public goods and service de-livery. – Appropriate ways should be worked out so that the development projects promoted by the Cameroonian Diaspora can be integrated with the formal programs sponsored by the mainstream development agencies at the field level. – The Cameroonian Diaspora associations should make an inventory of their development projects in Cameroon, and create a central Diaspora project database. – We propose to annually held a Project Information-Sharing conference for the Cameroonian Diaspora groups to exchange their experiences and to learn from each other. – A permanent research program on the Cameroonian Diaspora activities should be initiated. That research program should be managed and implemented in cooperation with the Cameroonian Diaspora experts. The Cameroonians in the Diaspora represent a vital resource that needs to be fully tapped and encouraged to participate in the development of their country of origin. A productive human resource is an important aspect for the development of a country. The 2010 population or demographic census acknowledges that 2.2 per cent of the total population, approximately 200,000 Cameroonians live and work abroad. The Diaspora community consists of some of the most educated and highly skilled persons that can make a significant contribution if they could transfer some of that knowledge and expertise back home to develop Cameroon. The Cameroonians in the Diaspora also play an important role in the development of their country of origin through remittances, foreign direct investment (FDI), philanthropy, trade and culture promotion. The Cameroon government increasingly recognizes the contribution they make in poverty alleviation and economic development of their home country and has taken some positive steps to engage the Diaspora. While there are enormous opportunities available as a result of strengthening the partnership with the Diaspora, still there are some challenges that need to be addressed taking into consideration the interests of all concerned parties, that is the migrants, host country and country of origin. One should emphasize the shared responsibility of all stakeholders in protecting migrants and putting in place favorable policies to ensure that the benefits of migration are also shared. It is important that the Cameroon Government takes the lead in the partnership with other non-government stakeholders in working out the policy of engaging the Diaspora. This is because the process of managing migration involves people crossing state borders to access opportunities that enhance their livelihood. Hence, the states are in better position to provide protection for migrants. 1 Group discussion with the Notables of the Bali Traditional Council, Bali, August 21, 2012. 2011. Bushfalling: How Young Cameroonians Dare to Migrate. PhD Dissertation. Amsterdam: University of Amsterdam. 2002. Diaspora, mondialisation et développement de l'Afrique. Nouvelles Pratiques Sociales 15(1): 98–110. 2001. Defining Diaspora, Refining a Discourse. Diaspora 10(2): 189–219. 1993. Les immigrés, atouts du développement. Le Monde Diplomatique 477 : 25. 1993. Le nouveau désordre économique mondial. Aux racines des échecs du développement. Paris: La Découverte. 1999. Le rôle des émigrés dans le développement national du Sénégal: implications socio-conomiques et perspectives. Communication au colloque sur l'émigration sénégalaise: Situations et perspectives, organisé par l'Assemblée Nationale et la Fondation Friedrich Ebert, 10–11 juillet, Dakar. 1995. Les migrants, coopérants de demain? Projet 241: 80–88. Dumont, J-C., and Lemaître, G.
2005. Counting Immigrants and Expatriates in OECD Countries: A New Perspective. Paris: OECD. 2005. L'imagination africaine de l'Occident: Entre ressentiment et seduction. Etudes 403(7/8): 17–27. Mahroum, S., Eldridge, C., and Daar, A. S.
2006. Transnational Diaspora Options: How Developing Countries could Benefit from Their Immigrant Populations. UNESCO International Journal on Multicultural Societies (IJMS) 8(1): 25–42. 2004. Migration and Development. Washington, D.C. Migration Policy Institute. Nyamnjoh, F. B., and Page, B. 2002. Whiteman Country and the Enduring Allure of Modernity among Cameroonian Youth. African Affairs 101: 607–634. 2005. Counting Immigrants and Expatriates in OECD Countries: A New Perspective. Paris: Dumont Christophe & Lemaître Georges, DELSA. 2010. International Migration: Virtue or Vice? Different Perspectives from Cameroon. Paper presented at the European Association of Social Anthropology (EASA), August 24–28, Maynooth. Samba, Y., and Le Masson, O. 2005. Diaspora, développement et citoyenneté. Les migrants originaires du bassin du fleuve Sénégal (Mali, Mauritanie, Sénégal). URL: http://www.grdr.org/IMG/pdf/ Article_COTA_VersPaidelPimdero.pdf.